Buckminster Fuller gets some plucky new fans Dome living may have defined America?s 1970s back-to-the-land architecture, but today it defines the lives of Mikkel Mikkelsen?s Icelandic chickens. 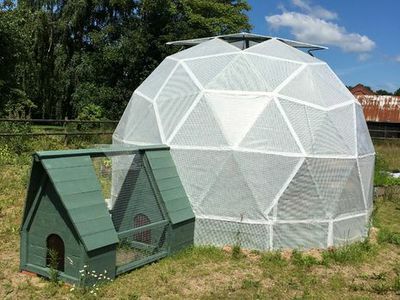 Mikkelsen is a 25-year-old design student in Denmark who designed and built his own geodesic dome greenhouse and chicken coop for just $475. Measuring roughly 13 feet tall, the structure has enough room to grow fresh veggies year-round and give the chickens a more hospitable space in winter. Using the dome-size calculator at acidome.ru, Mikkelsen determined the proportions of his greenhouse as well as the number and size of each piece of its frame. He then cut salvaged wood to the right specifications and assembled them in a family member?s barn. Friends helped him put it all together on site and he covered the finished frame with a translucent tarp material. He outfitted five windows at the top of the dome with automatic controls programmed to open and provide ventilation when the dome gets too hot. He then installed a self-sufficient water capture and irrigation system as well as interior planter boxes. The chicken coop is essentially a pitched-roof addition to one side of the dome, containing enough space for the chickens to eat, drink, sleep, and lay eggs, as well as doors to the outside and the interior of the dome. The yard surrounding the structure is fenced-in. LOSA MACIZA DE CONCRETO. Tutoriales de arquitectura.